The Planet Under Pressure 2012 Conference has just finished in London and released a statement as these things are wont to do. The conference itself is a biggie and is setting out the science (in a broad sense) in the run-up to the UN Rio+20 conference. It was co-convened by Lidia Brito and Australia’s own Mark Stafford-Smith and sponsored by the big international research collaborations IGBP, Diversitas, IHDP, WCRP and ICSU. The recommendations in the statement have been passed onto the D-G of the UN Ban Ki-Moon who has agreed to take them on board. Step changes in warming of a few tenths to 1°C can produce rapid changes in risks such as extreme heat and fire danger. Yet, adaptation-planning that follows the dominant model of smooth climate change makes gradual adjustments to keep up with small changes in extremes. In these circumstances, a rapid change can catch sensitive systems out. Poorly planned responses may also lead to maladaptation. Studies of prehistoric climate change in Victoria’s western lakes imply that future changes might not be smooth. 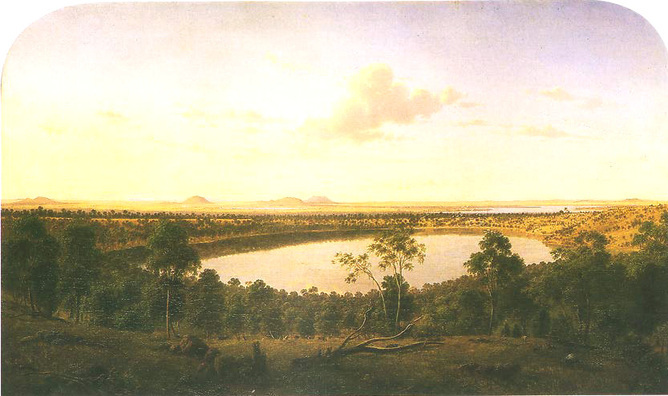 Dacre Smith's painting of Lake Gnotuk, from Views of Victoria in the steps of von Guerard. The run up to Rio 20+ is well and truly on with the Planet Under Pressure Conference currently underway in London. There will be a declaration that carries on from the Copenhagen Declaration but the focus this time will be on solutions. And a good thing, too. A host of other declarations are also being prepared and signed. The Natural Capital Declaration is a statement by the financial sector demonstrating our commitment at the Rio+20 Earth Summit to work towards integrating Natural Capital criteria into our financial products and services for the 21st century. Through it we wish to acknowledge and re-affirm the importance of Natural Capital in maintaining a sustainable global economy, and call upon the private and public sectors to work together to create the conditions necessary to maintain and enhance Natural Capital as a critical economic, ecological and social asset. Natural Capital comprises Earth’s natural assets (soil, air, water, flora and fauna), and the ecosystem services resulting from them, which make human life possible. Neither these services, nor the stock of Natural Capital that provides them, are adequately valued compared to social and financial capital. Despite being fundamental to our wellbeing, their daily use remains almost undetected within our economic system. Using Natural Capital this way is not sustainable. The Natural Capital Declaration is the first of its kind to be only open to signature by CEOs of willing financial institutions – a measure intended to get top-level buy-in by banks, institutional investors and asset managers and (re-)insurance companies. The Commonwealth Government’s Clean Energy Future scheme design is flawed. I, along with Richard Denniss from the Australia Institute, the Voluntary Carbon Markets Association and others have been pointing out this flaw and showing how it could be fixed, for over three years. The problem is that if a state government, council, business or household voluntarily cuts its emissions beyond what it is legally required to do (for example, under building energy regulations), this simply frees up more permits for other emitters to use, so their efforts don’t cut the total amount of carbon emissions. But Canberra econocrats and politicians have simply turned deaf ears. The frustrating thing is that this flaw is easily fixed. SOUTHEASTERN Australia could be shocked by a surge in wild bushfires and heatwaves, according to research suggesting that scientists might have underestimated the suddenness of future climate change impacts. So says the header in a short article in The Australian by science journalist Cheryl Jones, referring to this research. Heavily edited for space. Ah well.